I didn’t get my first dog until I was either 15 or 16. I had hamsters and rabbits before that. Oh and lots of lizards that kind of come with the territory if you live in Florida. It wasn’t until Josh and I were together that I had ever had a cat. Of course we got the spawn of Satan as our cat. She was always sweet around Josh but a holy terror when alone with me. It’s been nearly 13 years and I’ve almost got her tamed. Almost. So what happened? Adorable balls of fluff happened. Four 6 week old baby kitties were in my garden shed. Flea ridden and suffering from health issues because of those fleas. They were born during flea season, so it was just inevitable. Still, we rescued them. We had no intentions of keeping them. We got them the medical help they needed and tried to get them accustomed to humans. The housing market put a damper on our plans for having them adopted out. All of the no-kill shelters ran out of space. I was having a tough time already. I grew attached to them, of course. Finally, I started accepting that they would have to go to another home. It was hard. I wrote up little sheets about each of them, complete with likes and dislikes. I printed them out and put them in a folder for my husband to take with him. Then he told me that maybe we should just keep them. I was happy. I’m still happy with them. 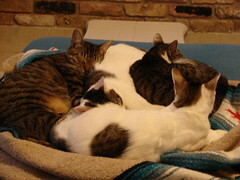 They are occasionally little pains but they still all love to cuddle and play. Even Sawyer has come around. They are nothing like I first experienced with the evil princess. I’m guessing she suffered from only child syndrome. Now she suffers from crazy old lady syndrome. We still love her though. So why this kitty reminiscing? Because in about three weeks it will be their rescue anniversary. Four little balls of fluff entered the house forever.